First, I would like to thank everyone for their thoughts and prayers for our neighbor who was struck by the pick-up truck while on his bicycle. He was air lifted to our children's hospital that day. His mom said he is one lucky boy...he is waiting for surgery and has alot of healing to do. He is the nicest boy in the world and so is his little brother. They are both polite and well mannered and we love them to pieces. We can't wait til he gets to come home!! 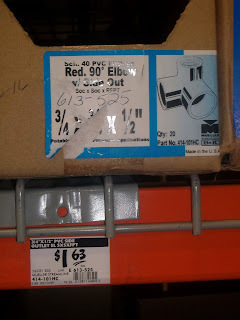 Now, onto Tool Time Tuesday...in the Plumbing Section! 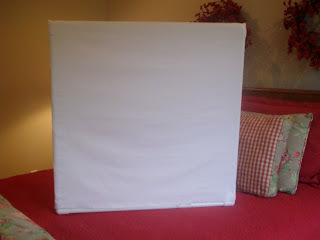 this...A Portable Quilt Design Wall. Woo Hoo!!! Finished size is 32" x 32". The next few pictures are your list of ingredients and the price tag for each at the hardware store. 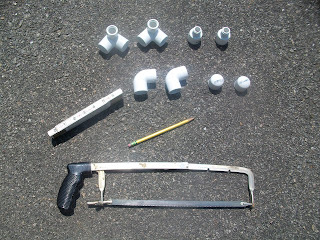 I used 3/4" pipe for everything. 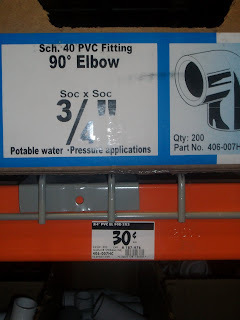 Make sure you purchase all the parts that go together...meaning all 3/4". 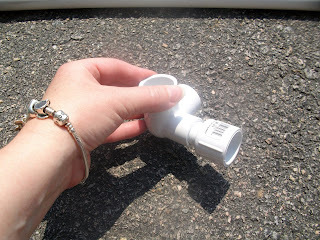 If you buy 1/2" pipe makes sure you buy 1/2" parts to match it. Here are all the other parts you will need, which will be explained in detail below. You will also need a tape measure, pencil, hack saw and a rubber mallet. 2 -90 degree elbow pieces for the top corners. 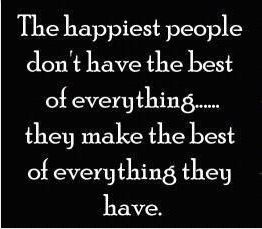 Make sure they are smooth on the inside, not threaded. They are 30 cents each. 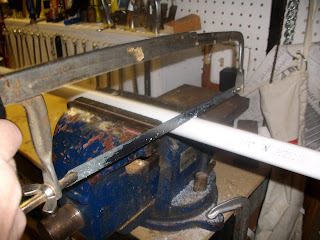 Next, you will need 2 -90 degree angled pieces that has a reducer on it. These will be your 2 bottom corners and support legs. I used the 3/4" that reduced it 1/2". You'll see why later. These 2 are the parts that go with the above picture. 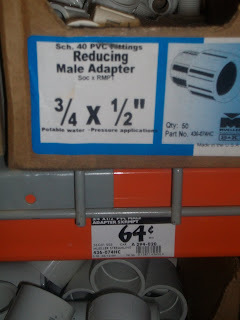 They are called reducing male adapter (what a name!!! I hope you find it on your own and don't have to ask for it by name!!!) They reduce from 3/4" to 1/2". These are 64 cents each. These are little caps that just finish off the raw edge on the support feet. You will need 2. 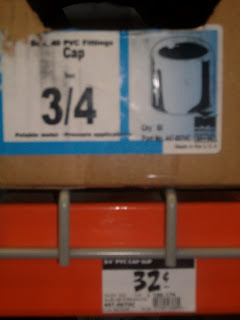 3/4" cap at 32 cents each. 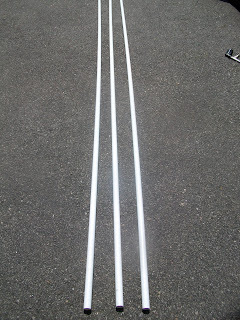 First, take one of the 10 foot pipes and make four pencil marks at 30" each. That will give you the 4 sides. From the second pipe cut 2 pieces that are 12" long. Sorry I didn't take a picture of the 12" mark. Have the super strong man in your life cut all the pieces for you. You can do it yourself too. I did the rest myself and it's pretty easy. Just start slow with the first movement of the saw, then have at it. 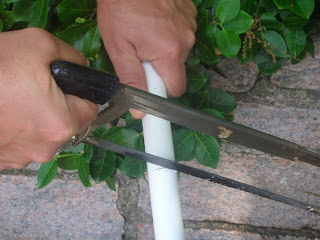 You can also put the pipe in a vice to hold it while you cut it...just don't squeeze the vice too hard on the pipe, just enough to hold it firm. I think you can also ask the hardware store to cut it for you. This is a close up of the adapters for the lower corners. 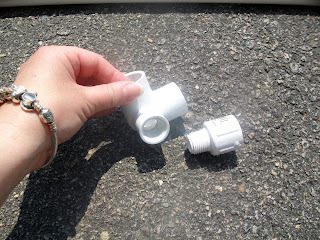 The 2 angles are smooth inside and the smaller one is threaded to screw in the adapter, which is where the legs will go in. Just screw it in and hand tighten. 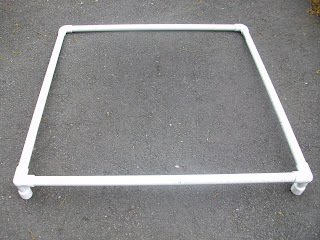 Place the lower corners so that the adapters are facing the back and place a 30" piece in the 2 corner pieces as seen below. If they are a little hard to insert, this is where you would use a rubber mallet to tap it in. 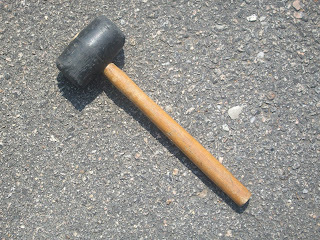 Use mallet where ever needed...even to tap it apart. 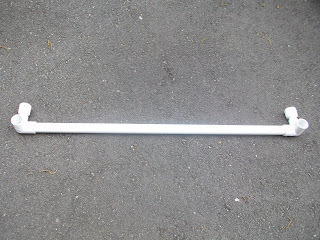 Now add the left and right side (30") pieces into the 2 holes on the top part of the angle. 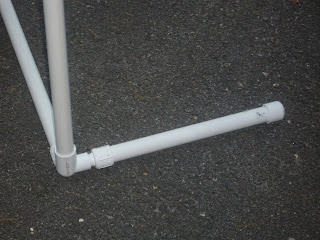 Take the last 30" piece and place the 2 -90 degree angle corner units on each end. This is how it looks when assembled. See the adapters facing the back. Place the 2 caps on the 12" leg pieces to finish off the raw edges. My husband had a great idea for the legs. I tried to make the legs short so they wouldn't stick out too far, but I was worried that it wouldn't keep it steady. 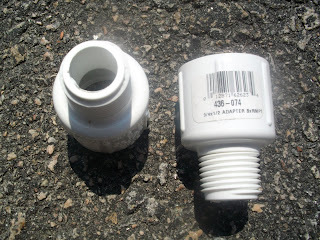 He recommended using a funnel and filling the legs with rice when the cap is on, then place them back on the adapters. This way it will weight in down. If you are traveling with this design wall to your guild or retreat, buy 2 more caps to keep the rice inside the legs when you break down the design wall for packing. Here is a close up of the leg together. and here is the finished frame....easy peasy. and CHEAP, CHEAP, CHEAP. 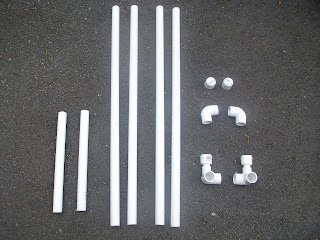 Total for pipes and corners is $9.02 plus tax from your state. That is a big WOO HOO. 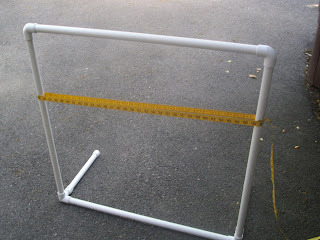 For the 23" x 23" design wall you would only need one pipe so that would be $7.40!! This doesn't include the flannel or felt that you would use to cover it. The fabric directions are next...see below. You can use either flannel or felt. For this smaller one, I used flannel that I already had on my design wall and just cut it up. For the larger quilt design wall that I will show you this weekend, I used felt. Both are great for blocks to stick to, but you can always stick them up with pins too. 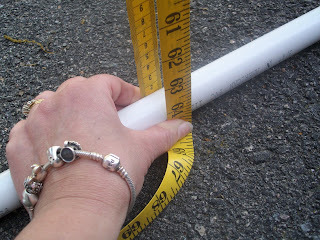 First, you need to measure the height of the pvc design wall. 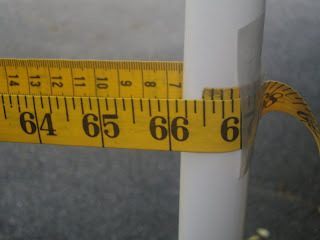 Below, I placed a tape measure over the top of the top pvc pipe. Hold the beginning of the tape on one side and measure the distance at the other side. 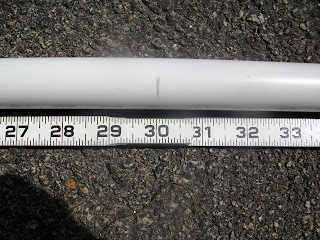 Mine measured 64". 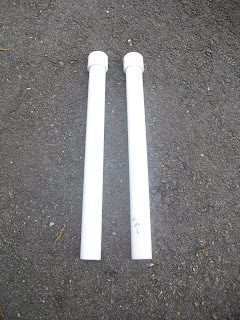 Yours should be close, but it depends on how hard you tapped the pipes into the corner pieces. 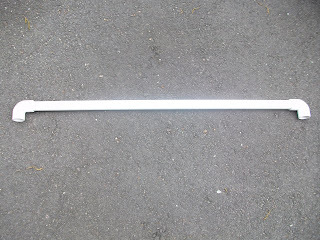 Next, you need to measure the width all the way around the whole piece. 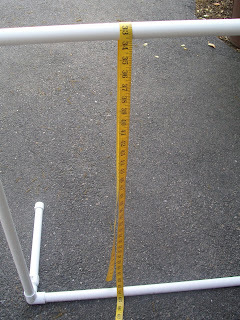 Place tape measure around the middle and pull a little tight. You want it tight so the fabric will be taught around the frame. The width of mine was 66 1/2". This is the only math you have to do... take the width measurement, divide by 2 and add 1/2" seam allowance. 66 1/2" divided by 2= 33 1/4" + 1/2" = 33 3/4"
So now you will cut a piece of fabric 64" long by 33 3/4" wide (if you get the same measurements as mine on your frame). Fold fabric in half right sides together (I don't think there is a right or wrong side of the fabric, but oh well). 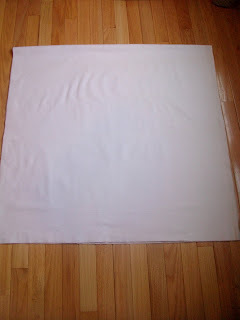 The picture below shows the square of fabric with the fold at the top. Sew only the left and right sides with a 1/4" seam, leaving the bottom open. Turn right side out. 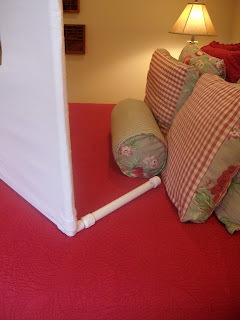 Slip over frame like a pillow case, with seams lined up the side pipes. If too loose, sew alittle more to tighten it up. 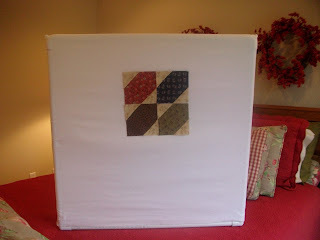 Here is your finished Portable Quilt Design Wall all set to go next to your sewing machine, cutting table or to your next quilt retreat. This will help you see what blocks may look like in different configurations before you sew them together. I really hope you like today's TTT and hope you can use it somewhere in your quilting world. 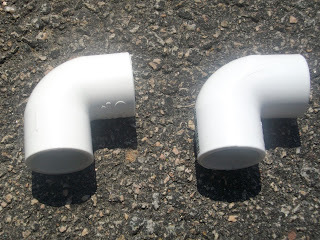 You can make these in any size to fit your needs and they can always be taken apart for traveling (tap apart with the rubber mallet if it gets too tight). also coming soon...is maybe a little carry bag for all the parts so you can take it on the go!! I have a TTT show and tell coming soon to my blog!! I took my favorite idea from your TTT's and made one! I will post it soon! Oh Karen, What a fabulous TTT I can hardly wait to give it a try. And I will say a prayer for the young mans speedy recovery. This is a terrific idea...perfect, actually! My family loves PVC! 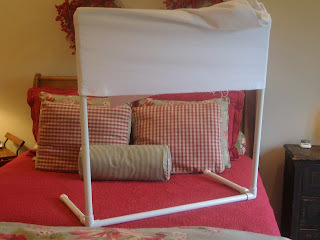 I've used it for years as portable quilt racks and Pete makes PVC marshmallow blow guns. I really like the joint you used to attach the legs. Very clever! We're glad to hear your neighbor will be OK. It was another reminder for my kids to always wear their helmets when biking. I am glad to hear that your neighbor boy is okay. Will continue to keep his family in my prayers. Yeah! I have wanted a design wall. Nice to have one that doesn't take up too much room and that is portable! Karen...awesome! I love this! As always, you are amazing! Super idea, Karen. I am soooo impressed with your ingenuity. 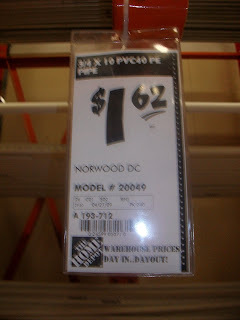 I think Home Depot should hire you to become an idea consultant. I'm curious. 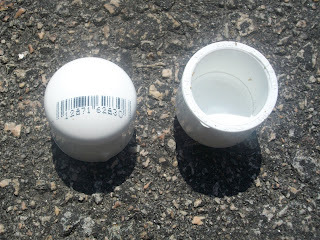 Did anyone raise their eyebrows, shake their heads or whisper in their partner's ears when they saw you walking around with your camera taking photos of the price tags of these things? Glad to hear the young man is doing better. I look forward to TTT. You are so clever. My brother is coming in August and I'm giving him your directions so he can make a couple of these for the Attic Window Quilt Shop where I teach. Thanks so much for sharing. I can't wait to see the directions for the big one! My studio is in the attic space of my house so I have long angled ceilings and limited wall space. After filling up most of that with wire shelving, I discovered that I didn't have anywhere for my design wall. I have been designing on the floor. I am so excited at the prospect of having a full size design wall again!! Oh this brings back memories of when I did shows, I made something kinda like this to hold all my aprons and I could take it apart. I sold when I quit and now look, I could of used it for a quilt block wall, which I need. Thanks for all your ideas. Hope your neighbour heals quickly and is home very soon. Another terrific idea. 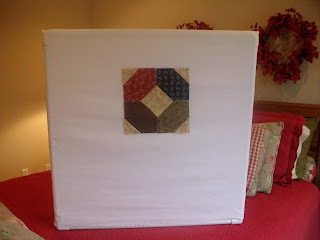 Wonderful pics and description for this portable quilt design wall! Honestly -- your creativity amazes me, Karen! Very nice idea for a portable design wall.... Your picture of the larger size looks like it coud also be attached somehow to a wall to be used in a room and stored up and then also used as a portable wall. I'm looking forward to those directions! What a great idea and your directions are so good - and the pictures are such a help. Thank you! 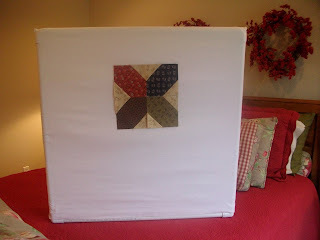 This is a wonderful idea and I am going to make one as a Christmas gift for my quilting friend. 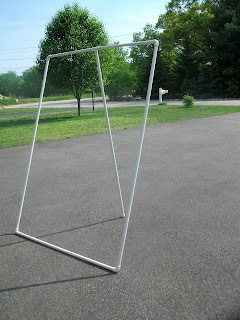 Have you posted the instructions for the larger frame yet? Love this idea; I'm going to make one this week (I hope). I was looking for directions for the larger one, have you posted it? 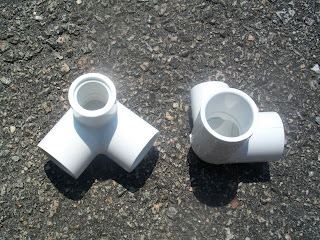 ATUL BRAND- Twenty years experience pipe manufacturer and supplier of Delhi/India, provide quality pipe manufacturing in pvc pipe, pvc conduit pipes, conduit pipes, pvc conduits. 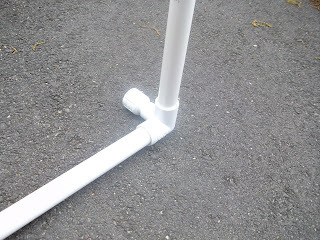 Well, in the South we make two of those PVC stands, stand them about 20-30 Ft. apart and sling a rope that has a golf ball on each end, at stands. We call that RED NECK GOLF. (drill hole thru ball and push rope thru and knot real good. 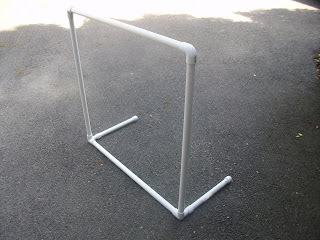 The "feet" on this project would also work for the pet gate if all else fails.